I am not so sure about this. Come check out my blonde adventure. I really don't think they have enough time to have fun. Unless they are a natural blonde. Blondes from a bottle spend all their time in the hair salon getting roots touched up. That is what I have come to realize as a new bleach blonde. My natural hair color is black or very dark brown. Last summer I lost my mind and bleached my hair blonde. I had not been blonde in 38 years. I felt like I had to try it at least once. I did it myself and documented my crazy adventure in an article on another writing site. It could be considered a disaster but I rocked what I had. I got a lot of compliments on it. I got tired of having to touch up my roots so I went back to my natural color in the Fall. 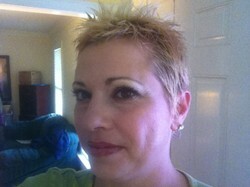 Well here it is Spring and I got the itch to go blonde again. Do I go to a salon like I said I was going to do? No.. I did it myself again. Same issues, same problems, and same irritated scalp. Regardless, I am blonde and thought I would share my second crazy blonde adventure with you. Spring is here and warm air is swirling around me. The sun is shining every day with flowers blooming all in my yard. I got Spring fever bad. So bad that I start feeling like I want to lighten my hair again. It is that time of year to lighten the makeup and go with more neutral shades and shades of pink on the lips. How great would that look with my blonde hair I thought. My hair is so dark naturally that I get tired of it. I feel like I have shoe polish smeared on my head. My hair is really short so it is just black with my really white skin against it. When my hair was blonde the first time I felt like my skin glowed and looked so good against the Ash Blonde color that I was rocking at the time. I will do this again for the summer and see what happens with it. I swore I would go to a salon and get it done if I decided to go blonde again. Well, no one that I found would take my dark hair to blonde. They were all scared to. So it was all left on me to take my shoe polish head blonde. What could go wrong? I had done this before and experienced every bad thing imaginable. Including losing so much hair that I had to buzz cut it. So I got this covered this time. Right? I bleached my hair last summer. My first experience with bleach. I repeated the process multiple times in one day and my hair broke off in areas. So I just got a really short hair cut for awhile. I mean really short. It was cute in the end and most everyone said they liked my hair. So I did not consider it a huge failure. It was a long time getting the blonde that I really liked, Ash Blonde. But it was all worth it in the end. So this is why I thought I could be successful this time. I should have learned from my mistakes is what I should have done. I got online and looked at a few You Tube videos on other girls who had gone from brunette to blonde. They all recommended Kaleidocolors Powder Lightener. They also discussed doing this in multiple applications spread out over a month or so. I knew I would have a problem with this part since this is what got me in trouble the last time. I did not have the patience to wait weeks in between bleach applications nor did I want to walk around with orange hair until the next application. So I told myself that I would HAVE to wait between applications this time so it would not damage my scalp or hair. I visited Sally Beauty Supply store and discussed what items I needed with the clerk as well. I gathered the Kaleidocolors Powder Lightener, Color Oops to remove any dark hair color deposits, the mixing bowl, brush, and an Ash Blonde hair color to tone it once it was bleached. I now needed to go home and think about this some more. I knew this would be a long process and it was very easy for something to go wrong. I really had to make sure I was ready for this transformation and the risk I would be taking. I got home with my supplies and discussed my intentions with my husband. He was not at all supportive since he knew what I went through the last time. He did not want to see me go through that again. I told him it would all be okay. I knew what I was doing.. right? I took off to the bathroom and laid out all my supplies. Took a deep breath and started mixing up the Color Oops. This is applied when you either color your hair and it doesn't turn out like you want or to simply just remove any hair color that has been applied to your hair. I had just gotten my hair touched up at my last hair appointment so I knew it needed to be removed before bleaching. I applied that and let it sit for 45 minutes. I then rinsed a couple of times to remove all of it. I used the blow dryer to dry my hair since hair color and bleach should be applied to dry hair. I then started mixing the Kaleidocolors Lightener in a bowl. Threw on my cape and was ready for the big moment. I started brushing on the lightener with the brush and got as close to my scalp as possible without touching the scalp. I did this all over my head. It smelled great, like blueberries actually. I set the timer for 30 minutes as the instructions had told me to do. I took care to wipe the bleach off the tips of my ears and from behind them as well as around my forehead and anywhere on my face. I could already tell it was red in those areas where the bleach had touched. Maybe it won't irritate it if I go ahead and wipe it off I thought. I felt my scalp tingling as I waited but did not think too much of it.. it was bleach after all. It was going to be harsh I knew. The 30 minute timer went off and I started to rinse my hair. Yep, it was a yellowish orange color. I knew it would have to go through this stage but actually seeing it in the mirror really shocks a person. I dried my hair and was surprised that my scalp actually felt fine. It did not irritate it too much I thought. So here comes the impatient part of me and stupid part. I thought that it would not hurt to do one more application since my scalp felt fine. It would get rid of the yellow orange tone at least and maybe leave me with something wearable. I Should Just Wear This Instead of Bleaching My Hair! I applied a second application of bleach or lightener. I felt it tingling once again and thought it is just bleach. It is supposed to tingle at little. I set the timer for 30 more minutes and waited. The timer went off and I rinsed the bleach out. I noticed that the warm water was stinging my scalp. I had to turn it all the way to cold to make it stop burning. Oh no. I knew then and there that I had messed up once again! Why did I put a second application of bleach on my head? Why did I even want to be blonde again? All these thoughts were going through my head as I rinsed my hair. I looked up from the sink to see that my hair looked like Big Bird. Yep. It was a bright yellowish color. The orange tone was gone but the blonde was really a golden yellow blonde. What in the world was I going to do with this I thought. I felt my scalp burning too. I looked closer at my scalp to see small red blisters all over. Oh no. I had actually burnt my scalp once again like a stupid fool. At least my hair wasn't coming out in chunks like the last time. I was looking for whatever positive things I could in this. My scalp was really burning so I applied a conditioner again to help moisturize it and help to stop the burning. That worked for the time being. Now to figure out what to do next. Is it Blonde or What? I knew I had to let my scalp and hair rest so I was finished with the bleach or anything else for awhile. My scalp was tore up! My hair was fine but needed a good cut anyway. I trimmed it up making sure to get the dead ends all off. I had to put an antibiotic ointment on some areas. It was so tore up that there were sores in my head from the bleach. My ears were even burnt on the tips where I had washed off the bleach. Ouch! I could not believe I did such a stupid thing. Again! A couple of weeks later my hair is somewhat blonde but still not to the color that I really want – Ash Blonde. I have the color here but will not touch my head for another couple weeks at least. I will live with Big Bird Yellow and rock it the best I can. I think this is the last time I will try to be blonde again. You can already see my dark roots shining through. I see that anyone who is not naturally blonde has to constantly touch up their roots. So I am not sure that they have any time left for fun. Have I Learned My Lesson? I would not suggest that a dark brunette attempt to go blonde at home. It is really too risky. Go see a stylist and have it done. In my case, I could not find one to do it. So that should have told me something. I think I get it now! If you are the brave one and insist on trying this at home I would suggest using the Kaleidocolors Lightener. It was my fault that it burned my scalp. It really smells great and quickly lightened my hair. Argan oil is another essential item to get your hair feeling soft again. Just apply one application of the lightener. Wait a few weeks before re-applying. Don't get impatient like me and do two in one day. You won't be happy with the outcome. Do I Look Better as a Brunette or Blonde? For removing any previous hair color that has been applied. This helps restore your hair after bleaching. This lightener smells like Blueberries. Used to apply bleach to your hair. To keep your hands from getting irritated when applying bleach. Brenda - you hit the nail on the head girl. I do have a mood disorder and am sure it contributes to my impulsiveness. I do things like this all the time. My husband just shakes his head at me. Writing about it and kind of laughing at myself is one way to deal with my craziness. Hey. I am providing you guys investigative reporting on things like this.. Ha. Angel, I had to laugh at this. You're a brave woman. I also think you're bipolar like me. Crazy ideas pop in my head and I go for it without even thinking. Although I voted brunette, I do like the blonde wig. My natural hair color is the same as yours. It came from the Native Americans on my father's side of the family. I've always been proud of it and wished it had been jet black like my father's hair. You are a scream! sheilamarie - Thank you so much. Most like my brunette hair better too. I am not sure why I feel the need to do this to my hair for a few months during the summer...? It is fun to change things up a little. I will be back brunette soon. Thanks for stopping in to comment. Katie - yes that red was quite a shock for me. I don't know why I don't just leave all this up to my hair stylist. I have to intervene and botch things up for her to fix. She loves me! Thanks for being interested in my hair adventures. @brl - I have had my hair burgundy for awhile. I really liked it. You are right. The process to get there is crazy but once you get it the color of blonde you like it is so much fun and worth it. Thanks for commenting. I think you look so pretty as a brunette that I wouldn't mess with it. But then again, I don't even like to dye my grey hair! Hmmm, I'm partial to that lovely shade of red while in progress, you are so adventurous. But you make a really good point those of us who are determined for that drastic change, needing to mix things up are destine to do it ourselves. Great hair color adventure. @2uesday - I am crazy when it comes to my hair and makeup. Always trying something new. I think the brunette color does suit me better because of my eyes but love the blonde look during the summer.. something different for a little while then back to brunette soon. Thanks for reading and commenting. @kinworm - I do have some hair adventures now and then. I have to document them to laugh at myself. I think I will wait this blonde thing out and let my scalp heal before I put anything dark back on it. But plan to go ahead and just accept my brunette hair and dye it back dark. I love your hair adventures -probably because I'm not adventurous with my hair at all. I love your dark hair and it doesn't sound like being blonde is much fun for you. Ever wonder if someones a natural blonde or not? Learn the tell tale signs of a dye job and how to make sure no one can tell if you color your hair. Get the tips and tricks here. Hair chalking, or coloring your hair with chalk, has become a hot new trend for people of all ages. Have fun with this temporary hair dying method.